...: 10 things I love about Christmas. I have made it quite known that this Christmas is "The Credit Card Christmas" I am pretty sure that I am not alone in this, at least I hope I'm not... Christmas is always so trivial because besides Birthdays, it is the only time of year that you "have" to buy gifts for people. Honestly, I dread it. Let me tell you what I love about Christmas though. 1. Food, My mom makes a killer Italian dish once a year called Bakala it is the most amazing thing in the WORLD!!! 2. Family Jokes, before my family moved to Nashville, every year my uncle would put a fake rubber walnut in the nut dish, just to watch the frustration of whoever tried to crack it. 3. Family Fights, We're Italian never a dull moment. 4. The feeling of waking up Christmas morning, I still get that tingly warm feeling. 5. Dressing up in festive gear! I found the most amazing red and pearl belt at the Goodwill Outlet last week!! I can't wait to wear it! 6. Listening to Phil Spector's Christmas Album...the best! 7. 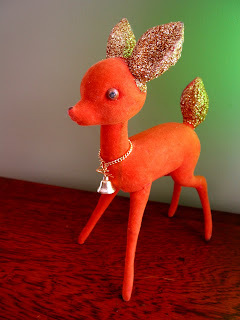 Decorating, my favorite decorations are my vintage Japanese Christmas toys! 8. Dancing, at some point in the day dancing always occurs. Whether it be my niece and nephew showing us their moves or the whole family rockin out. 10. I really love how everything stops for this one day, I love that all of the stores and restauraunts are closed. The only thing that matters on this day is being with your friends and family.